After the craziness that was last week, Dave and I were out and about in June 2015 at Bistro 13 to end the week off on a high note. 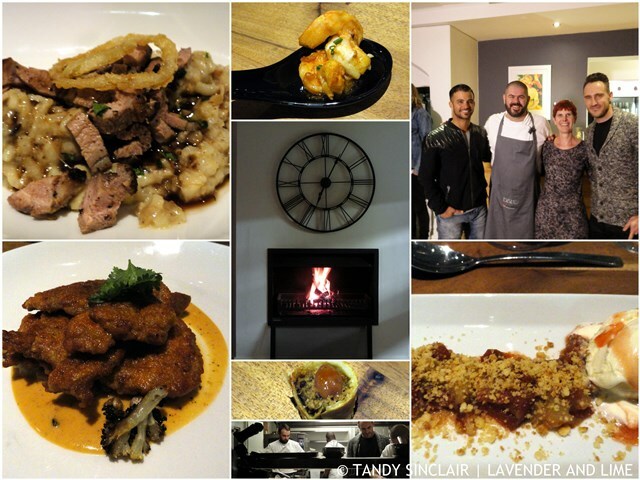 I was there in my personal capacity, but thought I would share with you photographs of our meal, and of me with Faf du Plessis, the South African cricket captain, his team mate JP Duminy, and Nic, the chef / owner of the restaurant. Faf is a part owner of Bistro 13, and is enthusiastic about food. The evening was filmed for television and will be shown on Bravo! on Kyknet (DSTV) on Thursday evening. Lisa Heald from Shed Marketing was asked by Ocean Basket to send me a gift and I was also sent vouchers to the value of R200. Dave and I decided that as Tuesday was a public holiday we would go out for a fish meal on Monday night. We chose the Ocean Basket in Strand as it is situated opposite the beach and the view of the sea always makes a meal perfect. The service was pleasant, the atmosphere quite nice and we had a good meal out. Bread is served while you are reading your menu. It comes with chillies, garlic and tartare sauce. I had grilled halloumi to start and Dave had mussels. The sauce was divine and I dipped my squeaky cheese into his sauce on more than one occasion. We shared the seafood paella for our main course and it was more a rice and seafood dish than a pealla, but it was extremely tasty. 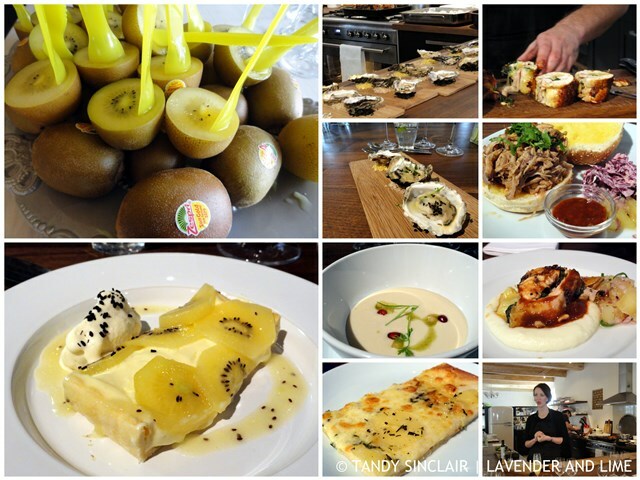 Chanel Burke from Storybook Communications invited me on behalf of Zespri Kiwi Fruit to attend a lunch at The Demo Kitchen to showcase their SunGold Kiwifruit. Created by cross breeding different varieties of kiwi fruit (there are over 300! ), these gold kiwi fruit have a lovely sweet melon flavour. If you are lucky enough to live in Asia, you can find these alongside some red ones in your local markets. Kiwi fruit are vine ripened and only picked when the sugar levels are correct. The tropical flavours were paired with various dishes. Our morning begun with a mimosa which was drunk with oysters that were topped with kiwi, ginger, lime and black sesame seeds. I could have done without the sesame seeds (not my favourite) but saying that, the oysters were delicious. We then moved onto a white gezpacho soup which was quite sweet from the addition of the kiwi. Our next taste was a pizza bianco but I found the kiwi to be far too sweet for me once grilled. The main course was a choice of pulled pork (scrummy) or chicken. Both were basted with the most divine kiwi fruit BBQ sauce and served with a pickled kiwi fruit salsa. Our meal ended with a French fruit tart, served with an old-fashioned kiwi fruit ice cream. Nice, Tandy. We envy Dave to have those mussels. They look mouthwatering! 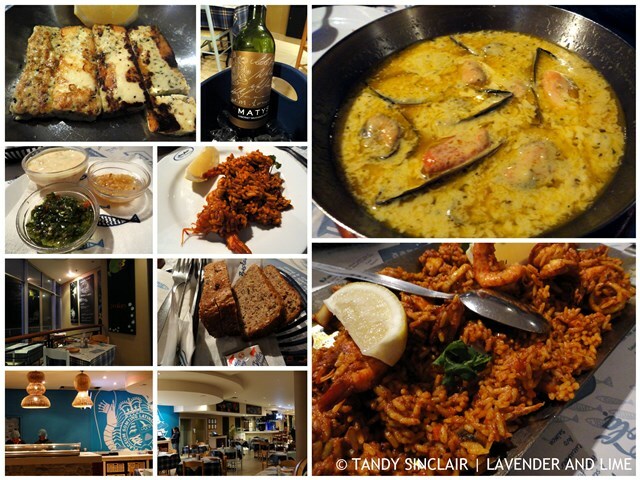 What a fabulous Bistro, Tandy! You lucky Lady to start the day with mimosas and with the intriguing “oysters that were topped with kiwi, ginger, lime and black sesame seeds”! All the dishes look amazing. I’ve been wanting to new restaurants and you just gave me new idea. Thanks Tandy. Dave’s mussels look terrific and the night looks like fun. They were both great evenings out! These are such great pictures!! What a blast Tandy! YUM! I love seafood paella! What a delicious time! A friend just did a sponsored post on kiwifruit too. It must be kiwi season! 😀 Who knew that there were so many ways to use it! It looks like you have been eating very well! The mussels look amazing from Ocean Basket – I bet your cheese was amazing dipped in that sauce. YUM! Hi Tandy, looks like a great time, the food sounds delicious! Looks like you’ve been living quite deliciously lately! I am inspired by the photos of that kiwifruit lunch!! What great things you got to do this week!